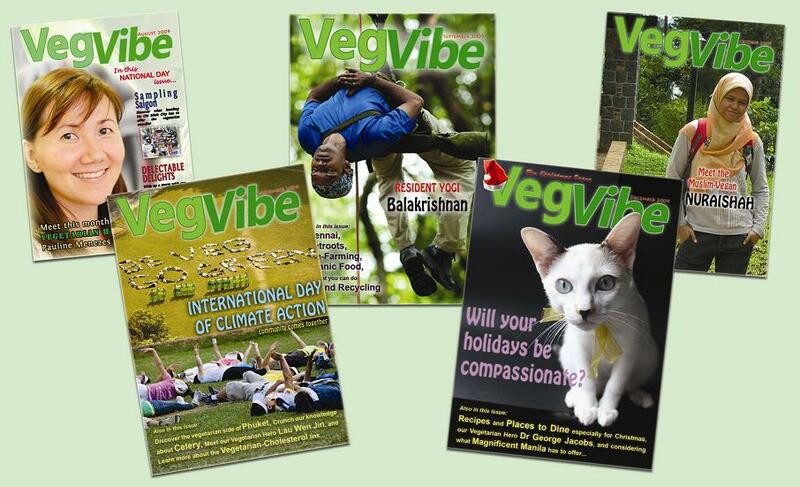 VegVibe is the only magazine in Singapore that covers anything and everything that is vegetarian and vegan, and serves as a uniting platform for related issues such as Health & Nutrition, Animal Welfare and Environmentalism. We publish once every two months and distribute the magazine free at over 70 locations across the nation. Our first 'beta' online issue was released on 12 August 2009 and our inaugural print issue was launched on 29 August 2010. All our issues in full are available for viewing/downloading via the link above, while the print issues can be found at over 70 partner locations islandwide. We engage a readership of about 5,000 per issue and reach out to the vegetarian and vegan community intimately, stay closely connected with animal activists and environmentalists, and attract non-vegetarians as well. Our print and online copies are distributed FREE and we sustain our operations through advertiser revenue. We feel privileged to have your continued support and invite businesses to tap the market potential of our exponentially-growing community through VegVibe. We welcome feedback, contributions, suggestions and friendship, so do feel free to drop us an email anytime at vision@vegvibe.com or vegvibe@gmail.com. Join us on facebook and meet like-minded people from around the world who honour the work we do as our fans. Comment on our stories and content and share your input to make our content even stronger. 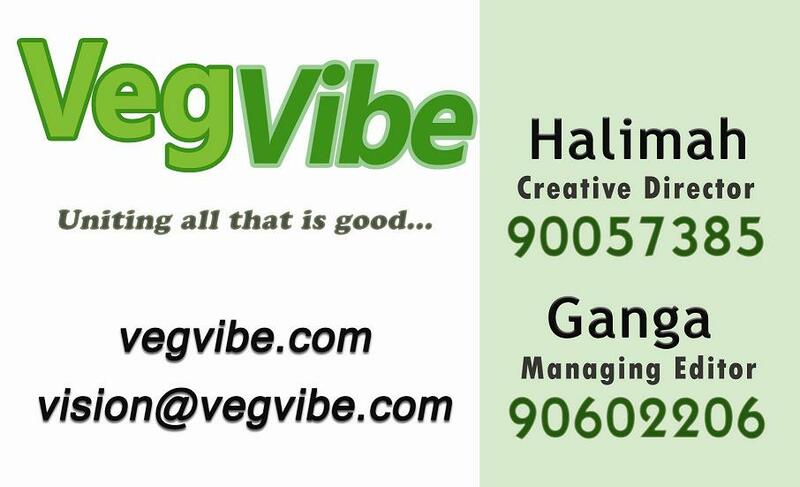 A project in the making since early 2009, VegVibe was conceptualised after its founders, Ganga and Halimah realised that many passionate people were not looking beyond their immediate interest area to see how they could contribute more to the bigger picture. For example, animal activists shed blood, sweat and tears ensuring that the welfare of animals - from the stray cats and dogs that roam our neighbourhoods to the exotic animals that are smuggled into and through Singapore. But they are seldom able to go beyond their tiresome work to explore ways to collaborate with their counterparts in environmentalism. Similarly, the environmentalists work hard to convince the public and the authorities on the importance and benefit of taking on initiatives that create a positive impact or lessen the damage on the planet. But they rarely have the opportunity to rope in animal activists or the health conscious members of the community to discover new avenues to get the message across faster. Meanwhile, the growing cohort of health conscious people who are moving towards a vegetarian diet are always on the lookout for delectable recipes and often invest time, effort and money to ensure a comfortable lifestyle that is good for their well-being. Unfortunately, these people do not actively seek out other areas that they can get involved in besides watching what they eat and fail to realise that they can do so much more on their journey of self discovery. This is where VegVibe comes in to use a refined combination of what particularly interests each of these groups with plenty of pertinent information that can be shared across them, and consequently facilitate the sharing of knowledge and experience. To illustrate, whilst the health conscious will read VegVibe for the nutritional information and the recipes, they will additionally learn of what animal activists have been up to recently. Meanwhile, the animal activists will read our reports on recent events and go on to learn of the environemental initiatives that might have been instituted recently. Similarly, the stories on animal activism will offer the opportunity for enviromentalists reading us to consider the possibility of a consolidated campaign to achieve parallel outcomes for both groups. Having been offering our online issues since August 2009, VegVibe has been well-received by the community and much cross-collaboration has already ensued. The strong response has motivated the founders to actively pursue bringing the magazine into print and this was realised on 29 August 2010. Our readership has steadily increased from a humble 100 downloads for the first issue, to the current 500 per issue with 3,000 printed copies. Conservative estimates on overall readership, taking into account email forwards that cannot be tracked and recirculation of the print copies, put the number of readers at about 5,000. Almost 300 readers have subscribed to receive the online issues and the facebook group has attracted close to 900 members. This is all the more impressive considering that VegVibe has mostly only spread by word of mouth since our first issue. Ganga and Halimah believe that VegVibe can achieve much and bring real impact to the world through the community of people who care - be it whatever they are passionate about. Over the past year, a comprehensive network of newsmakers has been built to ensure that VegVibe will be the first to report on matters that affect the community - be it animal activism, environmentalism, or health & nutrition. Moving forward, VegVibe aims to establish itself in Singapore before expanding regionally to encompass a larger and wider collection of passionate people. Being the platform that it is fast becoming in Singapore, events will be spearheaded to create specific opportunities for the various groups to come together and share ideas with a view to facilitate fruitful collaboration.